SHE’S SWEET. SHE’S FROM SAVANNAH. Fats Waller, Andy Razaf, and Shelton Brooks wrote this song in 1929 for the revue CONNIE’S HOT CHOCOLATES. I’ve read that Fats sold the rights to this and nearly 20 other songs to Irving Mills for $500 — a fortune in those days, but nothing compared to the money Mills made from that bundle. Alas. But back to the theme. To some, it’s not the most memorable composition — melody, rhythm, or lyrics — but I love it ardently because of the music its inspired, and because I always imagine a line of nimble chorus girls dancing to it. Like many of Fats’ most memorable tunes, it relies greatly on repeated melodic phrases moved around over the harmonies — simple to annotate but not as simple to create. Here are four recordings from 1929, in chronological order, and a later masterpiece. Consider the delightful possibilities. I wonder what else can be known about Lilian Morton, aside from the two sides she made for Parlophone, THAT’S MY MAMMY and AFTER MY LAUGHTER CAME TEARS (accompaniment unknown) and that in 1926, she was praised in a tiny notice in The Scranton Republican from Scranton, Pennsylvania, as “Broadway’s well known singing comedienne … a peppery singer of the original type,” with “a splendid voice.” She sounds very good on this recording. THE “POTATO HEAD” MYSTERY SOLVED AT LAST! The genial man to the left doesn’t exactly resemble Sherlock Holmes or even Dr. Watson, but he’s helped me solve a nagging mystery. 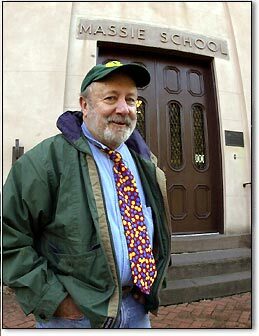 He’s Dr. Julius “Boo” Hornstein, longtime resident of Savannah, Georgia, and chronicler of its varied jazz scenes. His research, memories, and appropriate photographs have been published in his book, SITES AND SOUNDS OF SAVANNAH JAZZ (Gaston Street Press). In it, I found more than I’d expected about King Oliver’s last days and his benefactor Frank Dilworth — and anecdotes about Jabbo Smith, Johnny Mercer, Ben Tucker, and other improvising natives. 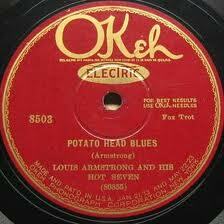 Recorded by Louis Armstrong and his Hot Seven in 1927, POTATO HEAD BLUES has been a mystery to many for nearly eighty years. The music itself isn’t mysterious — exultant, rather — but the title has puzzled jazz enthusiasts forever. Some plausibly have thought it came from the teasing way New Orleans musicians made up names for each other based on essential physiognomy — and one of my readers, Frank Selman, wisely suggested that the title was a sly dig at Clarence Williams, whose cranial structure resembled an Idaho Russet. Eighty pages into Dr. Hornstein’s book, we meet Sam Gill — not the Brooklyn-born bassist who recorded and played with Randy Weston, Monk, and Blakey, but a Savannah-born trumpet player who (as a young man) had met the down-on-his-luck Joe Oliver. Thank you, Sam Gill; thank you, Dr. Hornstein — we’ll all sleep better tonight!